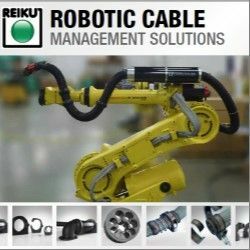 Company with 24 year history in robotics, invests in advanced workforce training and tools to meet accelerated demand for industrial robotics programming and integration expertise in manufacturing. The Port of Hueneme was buzzing with unmanned aerial and underwater vehicles at the second annual Maritime Advanced Systems & Technology Laboratory (MAST) and Expo held on June 10, 2015 and attended by 150+ exhibitors and guests. Festo is actively advancing the implementation of Industry 4.0: besides carrying out intensive research into intelligent components and decentralised automation, the automation producer is setting out to meet the requirements of Industry 4.0 with specific solutions in process automation as well. 06/11/15, 07:37 PM | Industrial Robotics, Mobile & Service Robots | Sensors and Circuits | Velodyne Lidar, Inc.
Collaborative robotics is a $100 million segment of the industrial robotics market growing at more than 50% per year. The two-day event offers a unique opportunity to explore an up-close look at new innovations in robotics, software and connection technology for use in the Life Science Industry as well as general automation. 06/11/15, 05:23 AM | Mobile & Service Robots , Unmanned & Other Topics | machine vision | Laser Components USA, Inc.